GiaMia Villa, costruita originariamente nel 1885 da mio grande bisnonno (Cesidio) per uno dei suoi figli (Pasquale), che ha avuto sei figli suoi (Raffaele, Giulio, Costa, Modesto, Damiano (mio nonno) e Armando). Sono nato in una piccola parte di questa casa nel 1949. Col passare del tempo la casa cadde in rovina e fu abbandonato per 30 anni. Nel 2006, di ritorno in Italia dopo 39 anni e vederlo nella condizione in cui si trovava ho deciso di comprarlo. Ho dovuto pagare una percentuale del valore di 21 diversi proprietari. Negli ultimi tre anni abbiamo completato i lavori di ristrutturazione e hanno ora un turista proprietà in affitto premier. Dagli ampi balconi supplementari (400 sq. Ft.) Abbiamo una vista panoramica sulle montagne circostanti, verde valle del fiume sottostante e ben coltivato terreni nelle vicinanze. Suoni di acqua che scorre e il canto degli uccelli è la norma per tutto il giorno e di notte si poteva vedere la Via Lattea e tutte le sue stelle a causa del chiaro atmosfera che è delizioso a respirare. Grazie per l'assistenza -Il unità attico -è 650 sq. Ft, pavimenti in ceramica in cucina e sala da pranzo, parquet in camera da letto, la cattedrale soffitto di legno pesanti travi a vista in legno, finiture in legno in tutto, doccia extra large. Abbiamo altri appartamenti disponibili, si prega di contattarci per ulteriori dettagli. After walking down Italy from the Swiss border to Rome, staying in towns large and small, Sulmona offers yet another aspect of Italian life. WIFI marginal but Michael was a very kind and attentive host who worked to ensure we had a great break in his apartment. We found it easy and interesting walking around the area, a trip by train to Pescara on the Adriatic Sea, catching the bus into town. We did feel we were able to sense the rhythm of the place and certainly enjoyed afternoons on the expansive and scenic deck. Large comfortable suite with a full kitchen. Huge balcony with a panoramic view of the mountains. A garden like no other; flowers, fruit trees, vegetables of all sorts. Fountains & ponds..... A perfect place for an Italian getaway! My wife and I had the good fortune to choose G V for our stay in Abruzzo. By the time we arrived we had had enough of the touristy places, being jostled about and finding ourselves in crowded places. As advertised, it is quiet and peaceful and while it feels almost remote when you are there, it is only a few minutes’ drive to Sulmona where there are enough activities, restaurants and nightlife to fill anyone’s calendar. The Adriatic beaches are less than an hour away, kids were back in school so not crowded and the “Indian Summer” weather meant we could spend more time at the beach than we had originally planned. The pace here was more relaxed and we had a huge terrace for morning coffee and even dining al fresco when we didn’t feel like going to a restaurant. With a fully equipped kitchen in the apartment it was a lot more fun to shop at the open markets and make a meal. Mike, the owner, had us picking fresh veggies and fruits from the abundant gardens. He has transformed the property by adding small lakes and ponds with waterfalls and a large deck that looks perfect for a wedding or party. A river runs along the edge of the property down at the bottom of the hill and a dozen cows are in the nearby pasture. The best part, for me anyway, was the HUGE shower with plenty of hot water and good water pressure. Every place else we stayed had a tiny box that you could barely turn around in, much less reach down to pick up a dropped bar of soap! 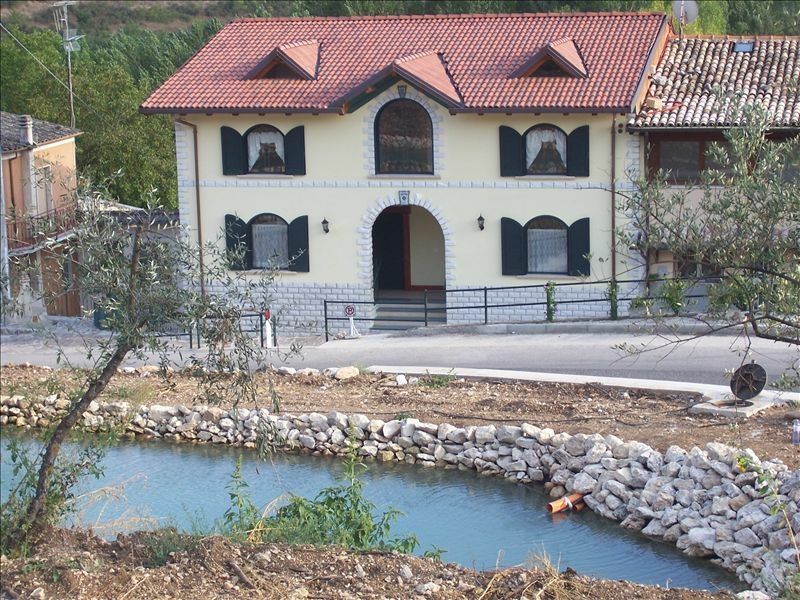 GiaMia Villas is located near Sulmona, 1 ½ hour from Rome and 45 min from the beach at Pescara. Mike was an amazing host. He responded to our emails and questions quickly. He greeted us with a bottle of wine and fresh figs, and was very knowledgeable about the area. He loves to talk about the history of each village and the area. Sulmona has a market, grocery store, and restaurants and it is the confetti candy capital (those “wedding” candy covered almonds). A car is recommended to explore the area, but Sulmona has good connections by bus and train so it is not essential. The property is in a beautiful setting, on a hill overlooking countryside and surrounding villages. It is really pretty at night, with all the villages lit up. The property has many fruit trees and we were welcome to pick any for ourselves. The apartment was very spacious and a good value and the property would be great for large extended family groups as there are many individual and connected units. The shower was huge and a welcome change from the typically tiny ones found in hotels. Mike, thank you for making our time at GiaMia so relaxing and special.